Gamification has become one of the key trends in digital learning environments. It depicts all that is motivating, from rewards and badges to teamwork and collegial support. The blend of these benefits successfully develops knowledge competency that influences the success of organizations. New-age learners access gamified eCourses, not with an intention to win but to learn and achieve. For instance, earning badges on completing a certain level is exciting, but not the end goal. Learners thrive to gain intrinsic motivation through an internal sense of achievements that appears after successfully accomplishing a task. Game-based learning is designed effectively, to drive the optimum benefits from an eLearning strategy. What Success Through Gamification Looks Like? Implementation of gaming concepts aligned with the psychology of gaming (determination, encouragement, and more). Effective strategies linked to defined objectives and training outcomes, which are directly connected to the workplace where learners apply knowledge and expertise. The inclusion of incentives, that do not focus on competition, but on achievement. The outcomes should always be that players know they have learned something new. Realistic, dynamic, and engaging tasks or scenarios that need critical decision-making and problem-solving skills. More focus on learning behaviors that highlight the customized needs of modern learners. Recognition of different ways people learn and get motivated to perform better in the workplace. Like any other activity, even gamification approach starts with different business objectives. Few of these goals include increasing sales, customer satisfaction, quality of innovations with reducing costs of development on new products. Each objective can differ but all that matters is the end results from the overall gamified learning program. The next step in this design framework is to delineate the target behavior essential to attain the business objectives. If the business goal is all about boosting customer loyalty, then different forms of behavior can drive the overall learning experience. For instance, the level of engagement that a learner requires or if a customer promotes company’s products and services, these are the forms of target behavior in this regard. Before designing the gamification network, it is crucial to understand the learners. There are varied elements that decide which gaming elements will best suit the tailored needs of learners. For instance, the degree of innovation in eLearning or social engagement can be of influence. The next step following that of defining business goals, target behavior, and knowing the target audience is to drive learner engagement. To get learners into a gamified program is one thing and to keep them engaged for long is another. Therefore, engagement loops are designed to motivate learners to access more courses and reflect the same type of behavior time and again. There are 3 stages in this loop—first, there needs to be motivation to depict the desired behavior, then the action in accordance with that behavior followed by an instant feedback. It is important to ensure that gamified eCourses are complete fun and exciting. Therefore, rewards and scores are given to the learners to grab the same level of engagement till the course is completed. For many of the learners, collaboration and competition are the important emotions that make them continue playing. 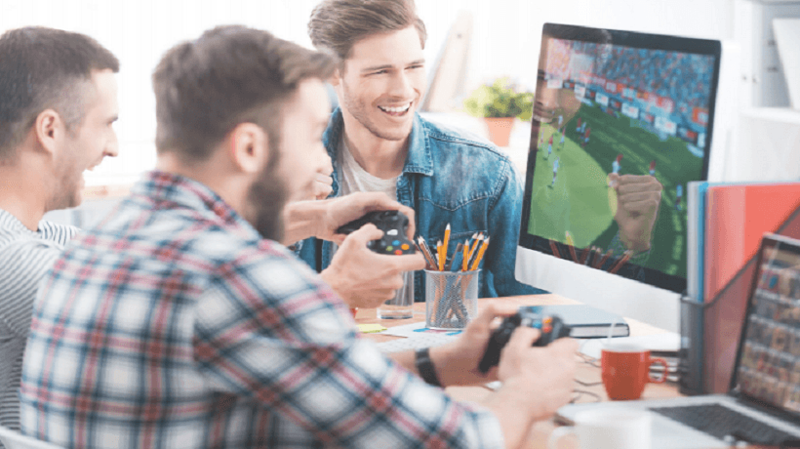 Lastly, different gaming components, including badges, avatars, achievements, virtual goods, leaderboards, and more are added to these eLearning courses. By choosing among these elements, a coherent and interactive experience is created. The above-discussed gamification framework holds the capability to gamify eLearning courses in today’s digital learning environments. Fun is also a must-have! So, it has become significant to gamify the courses to incorporate strategies that engage learners in multi-faceted ways and reinforce the overall learning experience.